Fejn hu leħni ta’ dari? X’se tkanta meta titwieled it-tarbija tiegħek? U x’se tkanta meta tħoss in-nuqqas tal-maħbubin tiegħek? Kif se tesprimi x-xenqa ta’ dak li jkun għall-art mitlufa fejn trabbejna? Fit-tfittxija ta’ dan il-leħen mitluf, L-Ilħna Mitlufa hi ċelebrazzjoni tat-tradizzjoni fir-ritmu u l-għana, espressjoni vokali li ntirtet mill-art li qabel konna tant marbutin magħha. Hu vjaġġ mużikali fit-tfittxija tal-leħen li xi darba kellna, użat minn dawk li ġew qabilna biex jesprimu l-biżgħat kif ukoll l-aspirazzjonijiet ta’ kuljum. Storja antika, minsuġa minn kantanti passati u preżenti u rrakkuntata f’poeżija – imlissna, miktuba u rrekordjata - fejn l-għannej bħala l-poeta, il-kustodju tal-memorja, ir-rakkuntatur u l-kummidjant, jgħanni f’isimna u f’isem dawk li tilfu leħinhom biex b’hekk tigġedded it-tradizzjoni mhux miksura; li nkunu flimkien fil-għana. Storja li ġġagħlek tfittex leħnek, u l-bżonn li tgħanni meta l-kliem ma jkunux biżżejjed. Where is my voice old? What will you sing when your child is born? And what will you sing when you miss your loved ones? How will we voice our yearning for the lost land where we were raised? 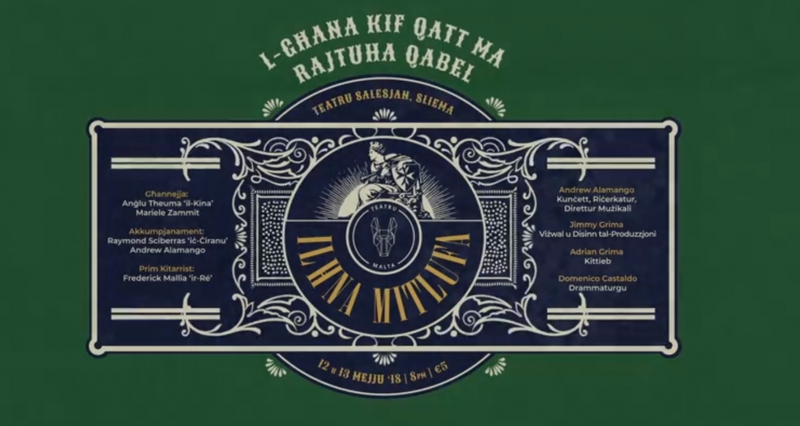 In search of this lost voice, L-Ilħna Mitlufa is a celebration of a tradition in rhyme and song; a vocal expression inherited from the land to which we were once so connected. A musical journey in search of the voice that we had, used by those who came before us to express their daily woes, fears and aspirations. A story to inspire and instigate the search to find one’s own voice, and the need to sing when words are not enough.